When I go op-shopping I have a little routine...check the fabric bins...check the bookshelves....rummage through the racks of 50c throw out clothes...then... I hold my breath and hope....as I delve into the boxes that contain the vintage doilies and linens , that I may find my next fabulous little piece of embroidered heaven !! ( note to self ...remember not to squeal with delight too loudly...those ladies out the back might start upping the price tags on things if they think I would pay more !! ). Some of my finds , inevitably , will have holes or stains in them. Then there are the rare few that are in pristine, straight from the glory box condition. Like this one .Yay !! Once home, I will attempt to remove the stains. 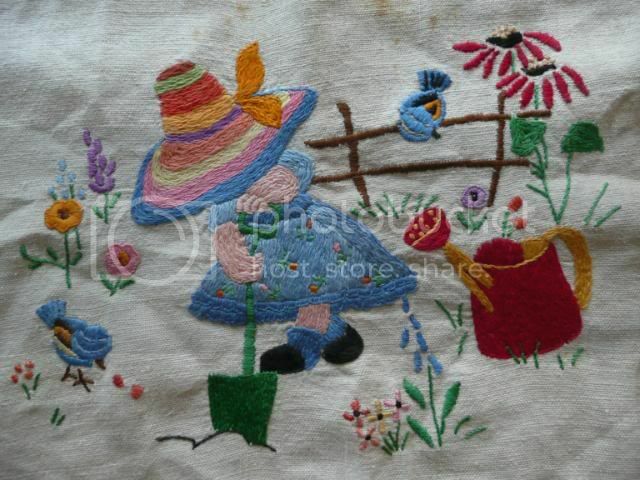 I have an evergrowng stash of stained and holey embroidered linens that I have grand plans for !! Yes, indeedy !! 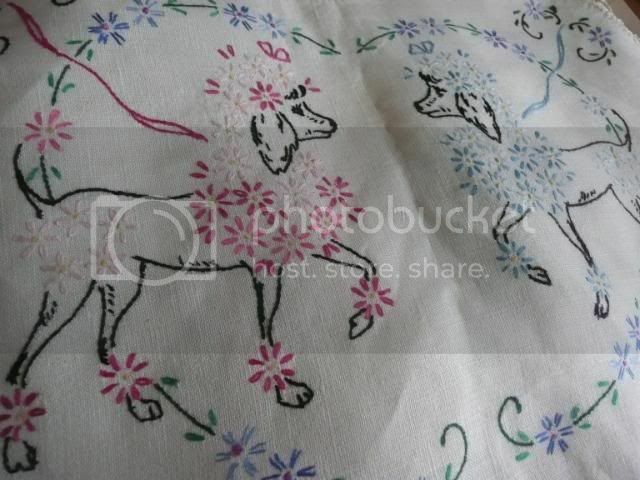 I want to use them to create a quilt featuring the embroidered pieces of these vintage linens . I have not found the exact pattern or idea for inspiration yet. I just know that is what I want to do with them . One day . 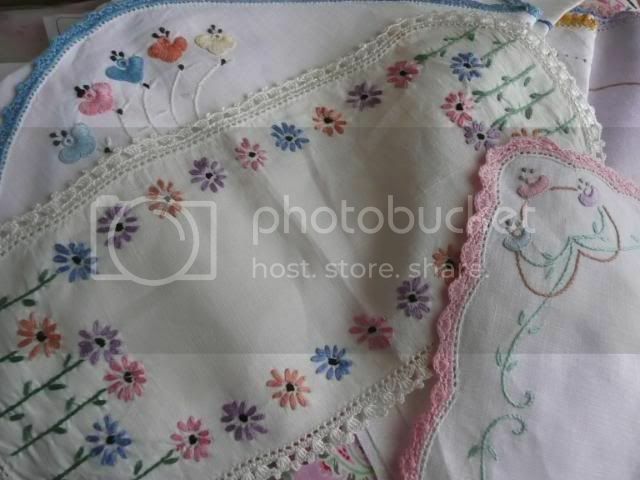 This is a vintage child's apron...adorable !!! Gosh, Peta some of that stuff is absolutely beautiful! I think my grandma had stuff like that, never really paid any attention when i was wee though. I certainly never seen anything that nice in the charity shops here, though I probably don't do enough digging! Hi Peta, I love those doilies. 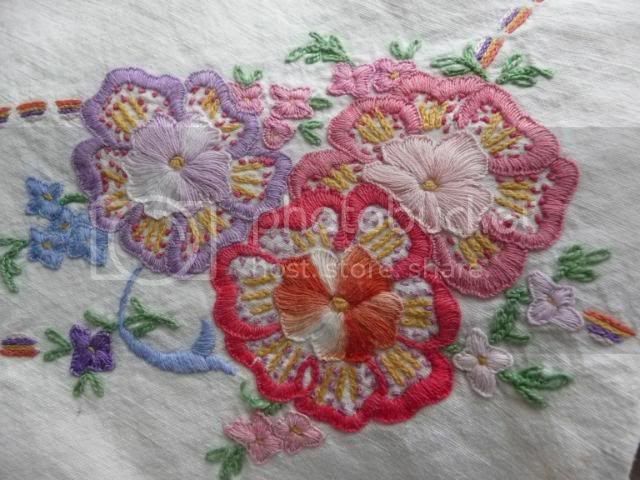 The embroidery is so amazing, an almost lost skill I imagine.I also love trawling through op shops for those little treasures of the past and have even convinced my husband to take me on an op shop road trip. Exquisite embroidery! Done in a time when TIME was not such a luxury as it is today. I tend to go for quick projects and although I love doing embroidery, it takes rather long to do. Happy Birthday Mr Magoo ! Fabulous blog with a fantastic giveaway !